Since the heady days of Google Glass, Mountain View has been fascinated by where augmented reality can take us. Glass burned Google a little, but the rollout of its Project Tango AR tech is slower and more considered as Google feels out this new terrain and how people are actually going to use this exciting new tech. I'm glad to see Google talking up AR at this year's I/O. On stage, Clay Bavor, Google's VP of virtual and augmented reality, talked about the future of both VR and AR for the company. He also talked about VR and AR as points on a spectrum, rather than competing entities. "In time, these points on the spectrum will blur: we'll have AR headsets that can augment your whole field of view, and VR headsets which can pull in photo-realistic digital representations of your environment." Bavor reckons that when we reach this point "the distinction between VR and AR will be far less relevant than it is today." In fact, the Tango tech is being used as the basis for Google's just-announced WorldSense tracking that will appear in standalone VR headsets from HTC and Lenovo later this year. But let's talk pure AR for a moment. As much as I like Daydream, it doesn't excite me as much as Google's AR ambitions do right now. Google's VR doesn't differentiate itself as much as its AR does. At I/O, it reaffirmed its commitment to AR with a couple of interesting announcements, including the reveal of its Visual Positioning Service (VPS), which works by accurately mapping the inside of buildings - like GPS for the indoors. "AR is most powerful when it's tightly coupled to the real world, and the more precisely the better," said Bavor on stage. While we're yet to see this in action, I got to demo some other projects Tango is being used on. 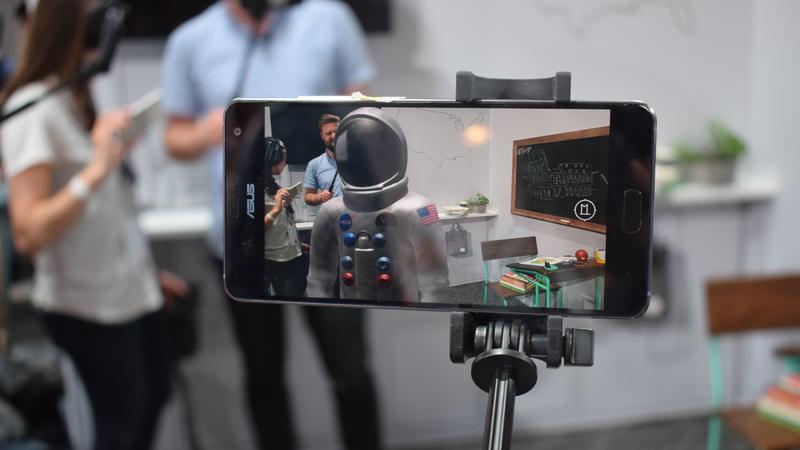 We recently reported that over two million kids have already experienced Google Expeditions in VR, but later this year Google is bringing AR to the classroom as well. I had a demo with this at I/O, where a Google rep played teacher, handing a group of us a smartphone each and giving us a quick-fire lesson spanning history, physics and biology (yes, it was an efficient class). As he did so, Tango conjured up objects like spacesuits, planets and an intricate model of the human body, which floated in front of us, convincingly visible, shadows and all. Google's drift correction technology looks at the visual elements around the room and, over the play session, learns the space so that the augmented elements don't "drift" from their spot, making them appear much more present. In another demo, an AR scarecrow actually started writing on the real wall behind it. For now, Google is only using Tango on smartphones and tablets, but the obvious use case is for this to one day live on our smartglasses or headsets. One Tango team member I spoke to talked about converging AR and VR, so you might have an AR lesson in the classroom before strapping on a headset for a more immersive experience in full virtual reality. But he was also enthused by the idea of one day being able to put AR right on people's faces, once the technology is good enough to not make us feel sick. A classroom of puking 10 year-olds? Nobody wants that. My excitement for what Google is doing in the AR space has been rejuvenated. As Magic Leap, Microsoft and (possibly) Apple all hope to blaze a trail in augmented reality, they should watch their backs for Google. Because while virtual reality will be amazing, augmented reality will be all-consuming, and I'm excited to see Google try to take us there.